Japan is a destination that has drawn us back again and again. We recently returned from our 7th trip over the last 25 years, the last 5 being in the past 4 years. This accelerated pace reflects several factors, including having family there (my mother is Japanese and her family is there), studying Japanese (slooowly) and Japan being a safe and user-friendly destination. But wait, that’s easy for you to say, you speak some Japanese and you have family there! That’s true, and while that has made it easier, I’d still argue that Japan is a fantastic destination for the traveler and traveling photographer who doesn’t speak a word of Japanese. Let’s drill down on this closer. I think few would argue with Japan being an extremely safe destination, even for single woman travelers, and the transport system is enviable. In a future post, I’ll focus more closely on transportation specifics. If you eat sushi, you are set for food. Japan can be more difficult for those who don’t eat raw products or seafood. Even many vegetable-based dishes are infused with dashi, a broth made with bonito flakes. The only item on my list that might raise eyebrows would be number 5, reasonable prices. The nexus of the world’s seafood trade, Tokyo’s Tsukiji fish market, is fascinating! It’s true, Japan CAN be expensive. But, transportation costs are reasonable, as I’ll delve into in a future post. The sky is the limit when it comes to high-end ryokans and hotels, and Michelin-starred restaurants. That said, I’ve enjoyed traveling in Japan at levels from low budget to high style. There are clean, safe and attractive options at every budget level. Especially now, in the Airbnb era, there are more options than ever. Another factor to consider, Japanese style accommodations may lend themselves to sharing with your traveling companions, with multiple futons available for the asking. It is perfectly possible to find accommodation for $50-100 US/night. At the high end, but an unforgettable experience, staying in one of 6 rooms in Tadao Ando designed Oval, reached by a funicular, in Naoshima Island. The same goes for food. It is quite possible to spend a small fortune collecting Michelin stars, which is fun to do occasionally. Very satisfying meals can be found relatively cheaply throughout Japan. Along the way, you’ll be able to sample staples of Japanese cuisine that can be relatively hard to find in the US, like okonomiyaki (Japanese pancake, a savory and filling meal). A Kyoto favorite of ours for okonomiyaki near Gion: Issen Yoshoku. A delicious and filling meal under $10 (best with beer), with colorful decor and fun artifacts. Only one item on the menu at Issen Yoshoku: okonomiyaki, prepared fresh all day on an open-air griddle in Gion in Kyoto. The most expensive version of okonomiyaki I’ve ever found was less than $20 and many versions are more like $6 US. A delicious meal of gyoza and ramen at one of the multiple branches of my personal favorite Ippudo, including beer, might total $20. Of note, there is no tipping in Japan, greatly simplifying transactions for the traveler and lowering overall costs. On a recent nature photography trip, we ate a surprising number of meals at “konbinis,” convenience stores like Lawsons or 7-11. They have a range of quick meals which are surprisingly edible and cheap. Bonus: they are heated for you as necessary. Another Kyoto favorite: Nishiki Market. Kyoto’s Kitchen is a great place to try samples and pick up an inexpensive meal. Shinto shrines and Buddist temples are the focal points of Japanese culture. In Tokyo, Sensō-Ji in Asakusa is Tokyo’s largest and most visited temple. Japanese festivals (matsuri) feature fantastic costumes and music! While I’ve never planned a trip around a particular festival, I’ve been fortunate enough to have happened on a few. Visiting Sensō-Ji (above), I lucked into seeing this annual matsuri held the 2nd Sunday of April: Shirasagi-no-Mai or white crane dance. Iconic landmarks like Kyoto’s Nijo-Jo Castle are even more special when lit up at night (“night-time illumination”) during cherry blossom season. Special night-time hours are offered by a number of temples during spring and fall. if you love contemporary architecture, a not to be missed destination in Tokyo is Omote-sandō, a street lined with designer stores housed in a who’s who of contemporary architecture. At one end of the street, is a small gem of a museum: the Nezu Museum (entrance pictured,) combining a jewel-like Kengo Kuma building with a collection of rare Asian art. It also features a stunning traditional strolling garden. Japan, particularly in winter, is a superb destination for the wildlife photographer. Traveling to Hokkaido in winter offers snowy winter landscapes, as well as unique and close-up wildlife encounters. Hokkaido’s Lake Kussharo in winter is frozen except at the geothermally heated edge, offering whooper swans a refuge as well as a close approach for photographers. A magnificent bird of prey, the Steller’s sea eagle, can be seen and photographed closely near Rausa, northern Hokkaido. Boat operations attract the birds by tossing fish into the water, bringing the Steller’s and white-tailed eagles into photographic range. 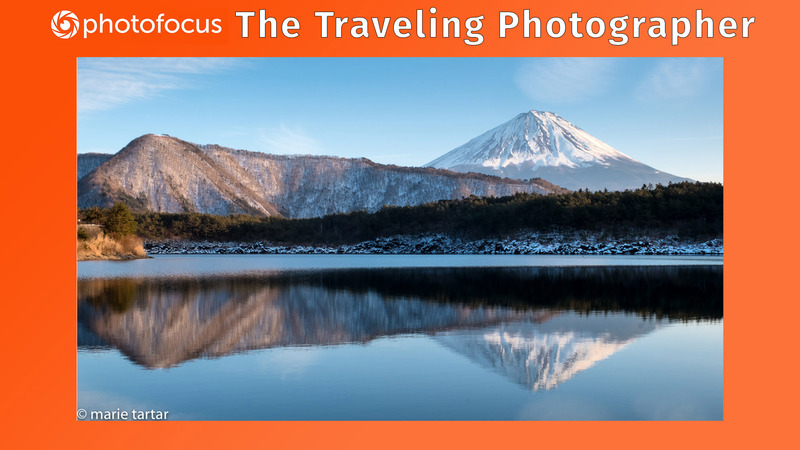 I hope this introduction has whetted your appetite for a photography trip to Japan! In follow-up articles, I’ll show how to get around, destinations to consider and specific logistics for shooting temples, gardens, scenics, and wildlife you may encounter in your travels to the Land of the Rising Sun.